I want you to visualise all of your YouTube video favourites. Are you visualising? Now, I want you to forget about picturing your YouTube faves, as this is something you won’t have to do for much longer thanks to YouTube’s new downloading capabilities. However, this isn’t completely concrete just yet. 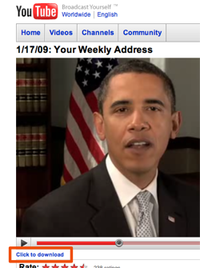 The ability to download videos is something YouTube is working on, with the service currently being offered on a number of videos, including (I say including, but this seems to be the only downloadable content on offer for now) Obama’s ChangeDotGov YouTube channel. Soon, we could be seeing the words “click to download” appear with all videos, not just a select few. This service has the potential to take all those cerazy fame seeking YouTube (or Rude Tube) stars to a wider platform, not to mention bringing more smirks to more faces. All videos come using the H.264 codec, so expect higher quality than the average YouTube video – which will be great for mobiles, being the same format as videos on the iPhone portal. Of course, there are the minor intricacies concerning privacy, piracy and copyright, which I’m sure are all kinks YouTube is trying to iron out as I type. Hopefully, it’s a feature we’ll be seeing all over YouTube soon. Win a trip to Amsterdam AND a free BeBook by designing a luxury e-Reader cover! Here’s an easy one. I watch Coronation Street and I voted for Obama. http://www.idesktop.tv/ have been providing a download service of YouTube videos for a while now.